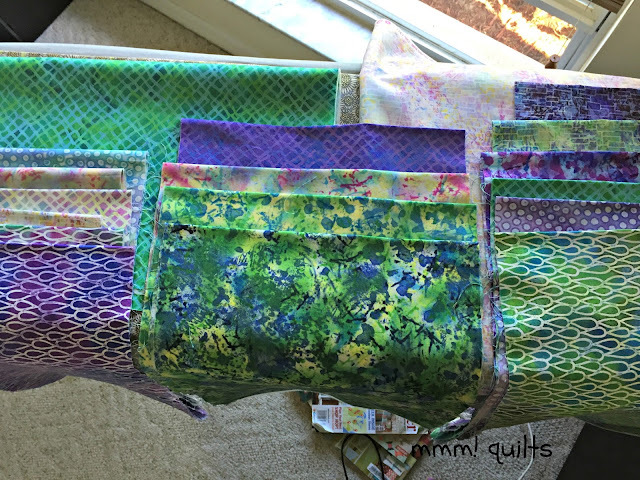 In order for you to begin planning for the start of our Freefall quilt along on March 20, here are the quilt stats, photo of the flimsy, fabric tips and requirements. 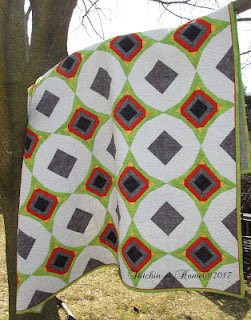 This quilt could most likely be done entirely from your scraps and stash; you could even go super-scrappy with the background fabric as long as the fabrics all read one value, probably light if your leaf is a medium or a dark. I would recommend keeping the shadow leaf all one fabric. Number of blocks: 25 total. 20 of these blocks are small leaves, 3 blocks make the big shadow leaf's point and there are 2 blocks that are plain. *The quilt has no borders; you are welcome to add some if you like, but there is no yardage for this in the requirements. Steps: will be released bi-weekly with a full month allowed to quilt your top. We will be making a wallhanging in Spring colours. Of course, you may make yours in Fall colours if you wish and get a jump on Fall. You could go totally modern and wild! Maybe totally scrappy. Patriotic for Canada's birthday! the big shadow leaf fabric--mine is the green. The photo below shows how I laid out my fabrics. I had 18 colours altogether; because there are 20 leaves, I cut two leaves out of two of the fabrics. The fabrics (two are missing in this photo oops) on the far left float on the green big shadow leaf. The fabrics on the far right float on the background fabric. Those in the middle will float on half background/half shadow leaf blocks, so that is why I laid them over both green and BG fabrics. **Remember that you want good contrast between these two fabrics. Also note that these yardages are minimal and won't leave much left over; if you prefer to allow extra for error or to add to your stash/scraps, then getting a yard of each will be more than plenty. Individual Leaves: There are 20. Each leaf can be made from scraps; you only need an approximately 7 x 11" scrap for each leaf. If you prefer yardage or precuts, either 1/8 yard or a fat eighth is enough for two leaves, so you would require 10 fat eighths, but if you want all 20 leaves different, then you need 20 fat eighths, since that is the smallest amount one can buy. You could also use a layer cake, which is a stack of 10" squares. So gather your fabrics and I will see you here on Monday for Step 1 Cutting! I have started a hashtag on Instagram, so feel free to post your fabric pull there: #freefallqal To see the original quilt, in Fall colours, Windfall, click here. Tish made me two wonderful colouring pages which you can download here. This may help with visualizing your fabric choices and placements. Any questions, just ask in the comments or email me. I am super duper happy that I have three more wonderful sponsors. Three more prizes! Second, I also am so pleased to announce another fabric gift certificate! This one is from Fat Quarter Shop, probably the first online shop I patronized regularly, and still do! Third is another Canuck, my good friend Joanne of Canuck Quilter Designs. Joanne and I have been friends for a couple of years now too; I've pattern-tested for her a few times (fantastic designs btw) and participated in her Snow Along two years ago. She is offering a free PDF pattern (check out all her beautiful designs here) from her Craftsy shop. This brings the prizes total to 12! Woo hoo! I used Stonehenge for a quilt not long ago and I sure hope I have enough of the of the tan and the red left. Otherwise, I see a shopping trip in my near future. That was a sweet anecdote about your father and I should at least have a patriotic top to celebrate the birth of that famous Canadian. I am off, as soon as it is daylight!! to sort through my batiks. This is so good to have all the amounts first, and for your Dad, what a tribute to know you have chosen his birthday date. 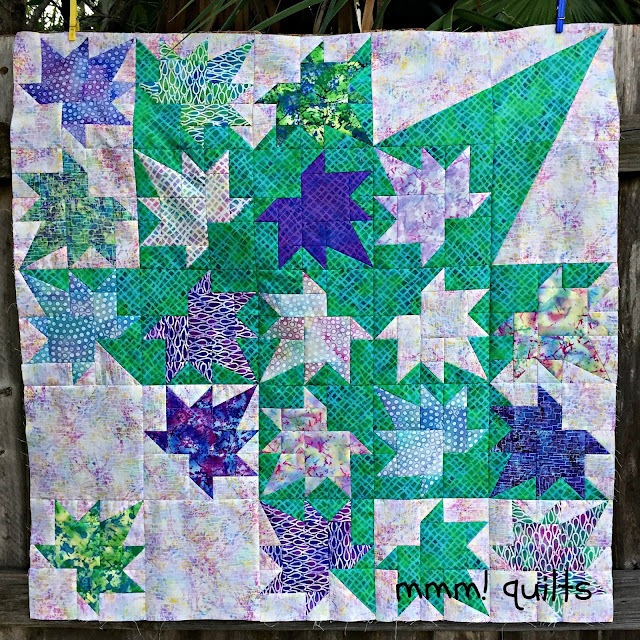 Purples, blues and greens are my favourites, might need to find a background one, or steal some from the 150 Canadian Women yardage. Sounds like your Dad was fun! I'll have to dig through my stash this week. Joining Jen, on the "not that I need to add something to my To-Do list"!! Love reading the story about your dad! Love the story. Your dad would smile. I don't remember if we were suppose to sign up ahead of time or not, but I am going to try to QAL! Thank you for the great introduction and now we'll all celebrate your father's birthday! I'm getting super excited for all of us to get started! Not sure if I can squeeze this one in or not, hopefully I can. *sigh* Try again and see if I can get it right this time! I am so not a cyber-guru! I've made the change .... I think? Meanwhile on to the important stuff, fabric selection! I am struggling with that. Lots of patriotics, but as for going with each other, NOT! Your dilemma? .... of course, you really MUST help the economy and get some more for your stash! p.s. I forgot to say that I love that the parade of quilts will be on your Dad's birthday : ). Thanks so very much Laura! I'm looking forward to seeing others' interpretations of my pattern. :-) I do hope you will see this because you are a no-reply blogger, so I don't have an email to send you this personally. You can fix this with the link provided below the comments. As with the others, the story of your father is so sweet! Thanks Sandra, for the Instagram update for me, still cannot figure out what I am doing wrong or not doing?? Off to finish the mini quilt for the Laundry day clothesline. It's going to be fun to see all the different versions come together. That's a beautiful quilt Sandra and very appealing for a quilt along. Let me know if you would be interested in giving away a "Crafted Applique" book too. Lovely quilt ! I will be joining the QAL and I have my fabric picked. I enjoyed the story; my birthday is the day before your father which in the States is Flag Day and it's printed on the calendars. I always got to say they raised the flag for me on my birthday.